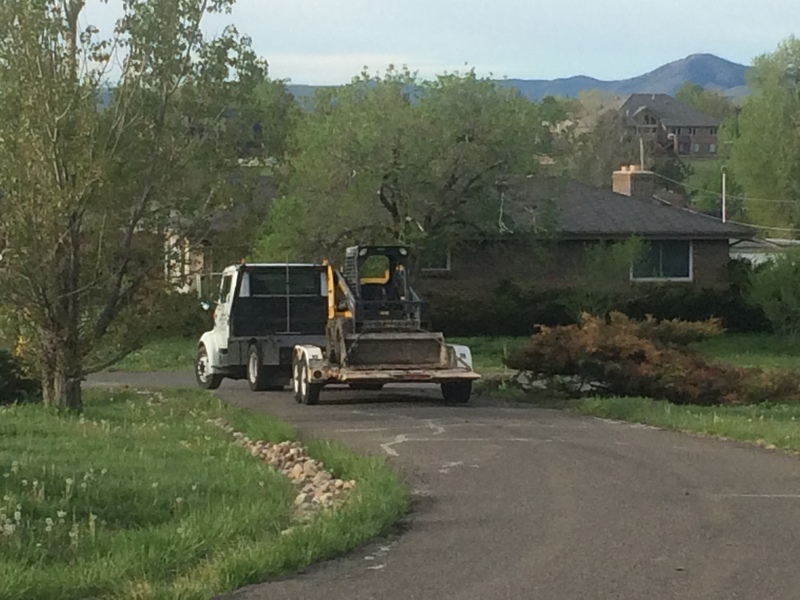 I rented a skid steer for the day from Arvada Rentalls. I decided moving concrete by hand was too slow and I wanted to scrape the grass off the slab area too. The machine required a large trailer to bring it home and the delivery cost was the same as the trailer rental so I had it delivered and picked up. When it was delivered the man asked if I was getting help in the form of an operator and I said no I would do it. He seemed alarmed, so I quickly said my husband would help. I don’t know why I said that! He seemed mollified though. 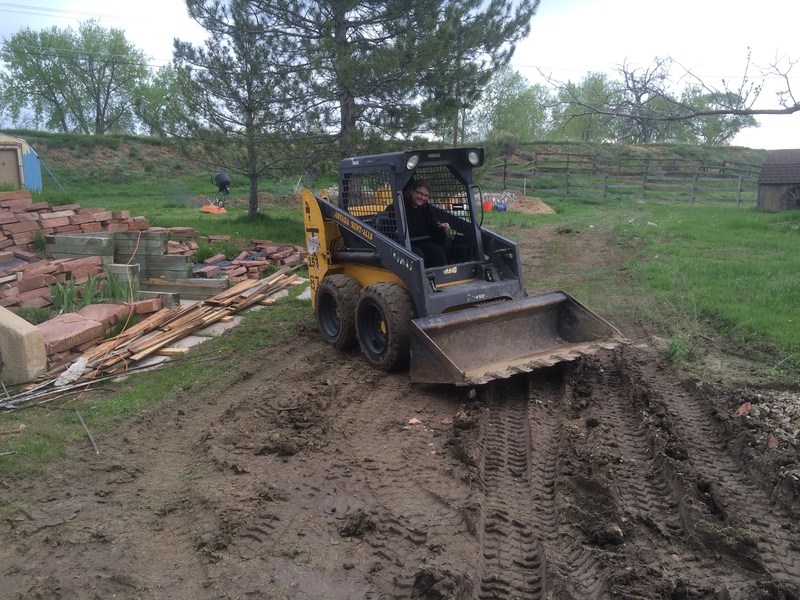 Dave did help but not by driving the skid steer. He helped me figure out how to put on the bucket and tried to get it off too but we couldn’t. Unfortunately it turned out to be a partially rainy day when I was expecting sunshine admittedly after several days of rain during the week. The forecast changed and it continued to rain for another week with some downpours. But I had to use it on the day it arrived and I was allotted 8 hours of engine time and 24 hours of time on location. 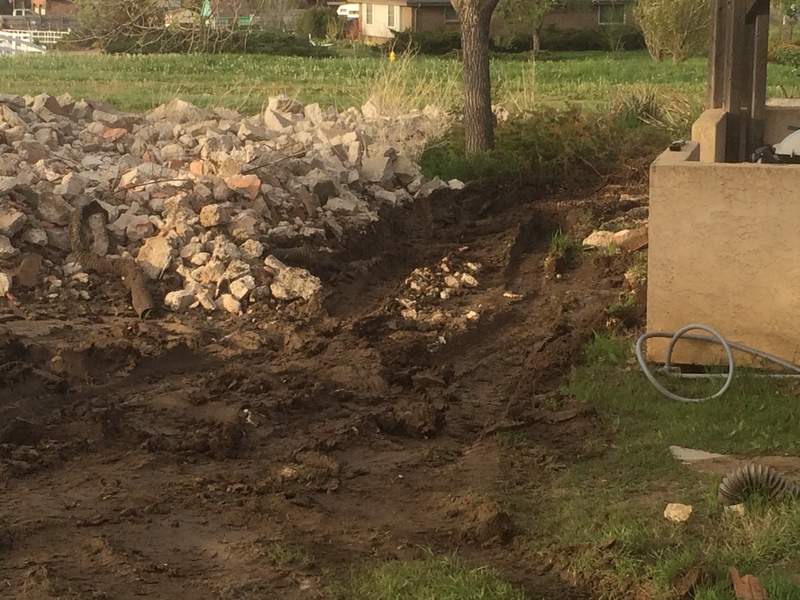 The main job for the machine was moving as much of the broken concrete as I could in the time allotted. That meant learning how to scoop the heavy concrete. 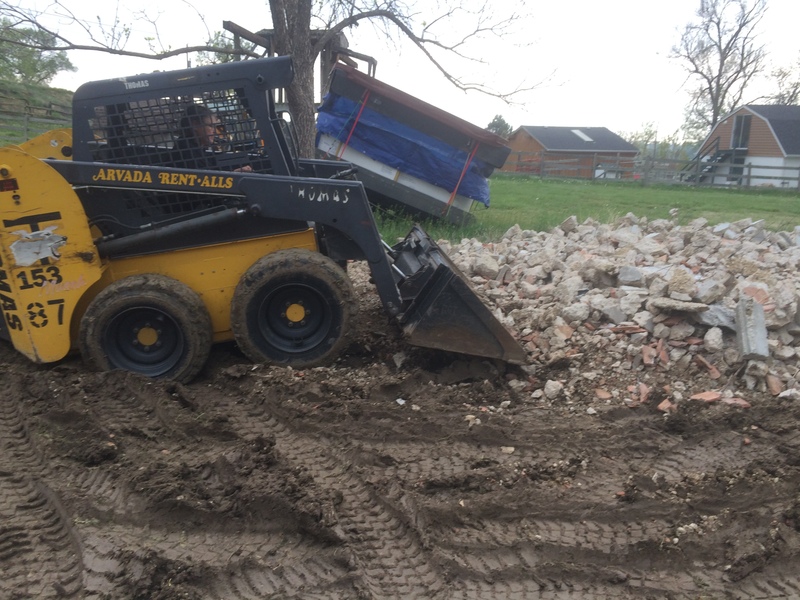 Although I read about how to operate a skid steer and how long it might take, learning was trial and error. The hand controls for steering were pretty easy to learn–I thought they were easier than a steering wheel. The controls for working the bucket were counter intuitive. They were foot pedals, with left controlling the lift arms and right controlling the bucket. Toe forward was down and heel back was up for the arms, but toe forward was up for the bucket and heel back was dump. So my feet had to be opposite to either lift the bucket into place or return it to the travel position. I kept getting it backwards and had to look at the bucket to see what it was doing. Needless to say my knees got a workout. I came inside to rest during the first shower but I was in the machine when it rained again and just kept on working. It didn’t seem to matter since I was enclosed and the ground was already wet. When supper time came I still had another hour and a half to work with the machine so again I just kept on going and missed supper with the grandkids, but Dave brought me some dinner that I enjoyed later. Because of the rain I had to approach the concrete pile from different directions making new ruts each time and then moving on to a different area. Once the ruts got so deep, I was getting stuck and there were a couple of times I had to rock the skid steer to get out of the mud. Still I got at least half of the concrete moved to the rear of the garden. And as a bonus I pulled out two dying evergreens, a huge juniper at the road and a large dead spreading evergreen near the front. I had to stop for a bit to go pick up the second load of rubber tile. We kept that on the pallet instead of unloading it to put it on the truck. I rented a forklift attachment hoping to get the tiles off all at one time. But I couldn’t get the bucket off to put the forklift back on. It came with the fork lift attached and we did use it to get a heavy pump mount out of the back of the truck. The pump mount will go in the concrete slab to reduce pump noise but it weighs 600 lbs so not easy to move! The next morning, the man who picked up the machine said the bucket was stuck from the mud caked on the bottom. He put the forklift back on to pick up the bucket and drive it onto the trailer. I asked him if he could try to move the pallet from the truck first, and he obliged but it turned out that the pallet was so heavy it was tipping the skid steer so he said he couldn’t do it and I ended up unpacking the the tile by hand. So off he went taking the skid steer to its next rental. This entry was posted in Landscape, Tools. Bookmark the permalink.